Why won't my ceiling light turn off with the wall switch disconnected? I want to install a ceiling light where previously only a box cover existed, no fixture. I connected the black wire to the black fixture wire, white to white, ground to ground. No other wires are present. I turned the breaker on and the light only stays on. I disconnected the wall switch completely but left the wall wires unconnected (black, white, ground). I think it could be a possible faulty switch. I turned the breaker on and the ceiling light remained on with no switch connection. 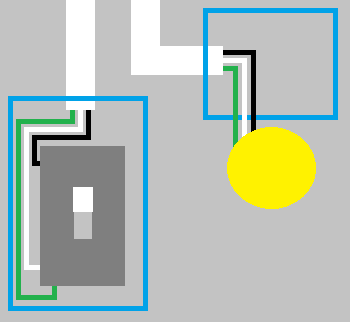 It's possible (as previously mentioned) that the switch actually controls a receptacle, or some other device. 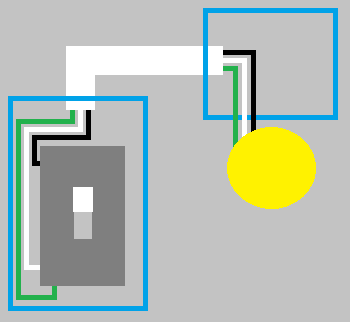 In which case the ceiling box is probably wired directly to the circuit, and is intended for a fixture with a built-in switch (pull chain). It seems likely the ceiling box is either not connected to the switch or has been bypassed. This can happen when the power starts at the light and the switch is remote from it. There should be a second pair (trio, with ground) of wires coming from the switch. If not, you have 2 options, run a 2nd wire to a switch or use one of the remote powerline modules, such as X-10. 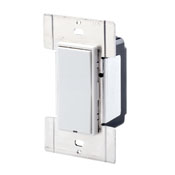 The Leviton HXC10-1TW is a single address controller that will remotely switch the socket rocket pictured. It does require power and neutral, but will work from anywhere in the house (once properly addressed). The multi point controllers are actually cheaper, but don't give you "in wall", exact replacement look. NB The SocketRocket is only intended for incandescent bulb use. CFLs or LED would require a different solution. Why won't my new ceiling light turn off? How do I wire a new ceiling light with 2 red wires? Light won't turn off, is there a short? Why does my switch trip the breaker after light fixture replacement?